Being a Bridesmaid Can Be a Pricey Proposition! 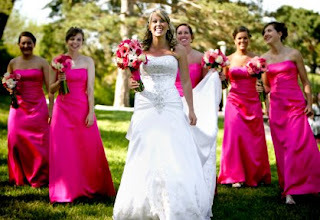 When you are asked to be a bridesmaid in a wedding, you typically assume you'll have to pay for your bridesmaid dress, but there are several other expenses you'll incur along the way! Add these up to a whopping $1836! In tight economic times, it's good to know ahead of time all the costs you are likely to incur so you can budget and plan for them. How much do you plan to spend? Do you have any money saving tips for other bridesmaids? Let us know! Save on bridesmaid accessories, bachelorette party items, and bridal shower favors at WhereBridesGo.com. Use coupon code BLOG to take 10% off your entire order, plus we offer free shipping on all orders over $100. Don't forget to share this coupon code with the bride too!